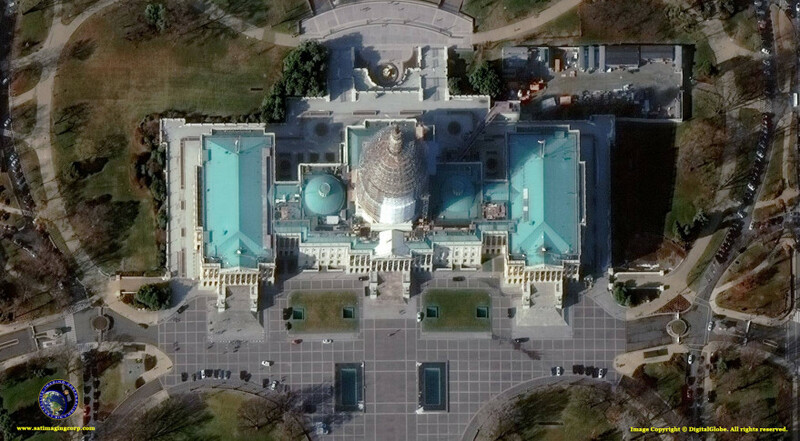 DigitalGlobe won't sell its highest-resolution imagery, such as the picture above of the U.S. Capitol building taken by the company's WorldView-3 satellite, to mapping services that give it away for free. Credit: DigitalGlobe and Satellite Imaging Corp.
PARIS — Satellite geospatial services provider DigitalGlobe will not sell its highest-resolution imagery to map providers that distribute it free of charge, preferring to pay a revenue penalty in exchange for maintaining the value of data that, for now, only it can offer, company officials said. In a July 30 conference call with investors, DigitalGlobe said its 30-centimeter-resolution imagery, available commercially since earlier this year following a U.S. government policy decision, has too much value to be thrown into the commodity mix along with other images used by Google Maps, Microsoft Bing and others. The company did not change its revenue forecast for 2015 but said the figure is likely to be at the bottom end of the forecast range. DigitalGlobe’s 30-centimeter imagery is from the company’s WorldView-3 satellite, launched in Ocotber 2014 and largely dedicated to DigitalGlobe’s anchor customer, the U.S. National Geospatial-Intelligence Agency (NGA). These images, the sharpest available on the commercial market, can discern ground objects 30 centimeters across and larger. NGA raised its yearly payments to DigitalGlobe under a 10-year contract – renewable annually – following the entry into service of WorldView-3. NGA renewed the contract, called EnhancedView, for the sixth year the week of July 27, Tarr said. With the U.S. government having approved commercial access to 30-centimeter data, Westminster, Colorado-based DigitalGlobe has taken its WorldView-4 satellite out of storage to refurbish it in time for a mid-2016 launch. That will increase the company’s 30-centimeter capacity available for commercial sales. DigitalGlobe is part of a global commercial satellite-imagery industry that, viewed from a distance, appears to be getting more competitive by the month as start-up providers with proposed satellite constellations focus on one segment of the market or another. But DigitalGlobe’s ability to offer the highest-resolution imagery is a market advantage that is likely to last for at least two years. Israel’s ImageSat and Airbus Defence and Space of Europe, based on work done for the Israeli and French governments, respectively, are both developing products to match’s DigitalGlobe’s 30-centimeter offering. But neither is expected to be able to field an equivalent capacity before 2017 or 2018. With the field to itself, DigitalGlobe was faced with the question of how to make best use of the first-mover advantage. Internet mapping services are part of DigitalGlobe’s Location-Based Services business segment, which in the past has accounted for slightly less than one-third of the revenue in the company’s Diversified Commercial division. For the first six months of 2015, that would put the Location-Based Services business at around $40 million, according to a July 30 DigitalGlobe filing with the U.S. Securities and Exchange Commission. DigitalGlobe’s total revenue for the six months ending June 30 was $347.4 million, with the U.S. government, led by the NGA, accounting for 65 percent of the total. Doing without a piece of the Location-Based Services business, even if that business is characterized by low-priced, high-volume image sales, is not what investors like to hear. DigitalGlobe’s stock was hammered July 31 as investors digested the near-term revenue shortfall. It recovered partially Aug. 3. In the conference call, Tarr sought to focus investors’ attention on the growth in other commercial markets and in its U.S. government business. Tarr said that depending on the region and the market segment, 30-centimeter data sells for “upwards of two times the price for 50-centimeter” imagery, which until the U.S. government policy change was the company’s sharpest commercially available imagery. It is that pricing power that DigitalGlobe thinks would be lost if it released 30-centimeter data into the ocean of images now available on anyone’s smartphone and laptop. Demand is especially great among the company’s 10 Direct Access Partners, which are governments that have signed volume-based buying commitments and have direct access to DigitalGlobe satellites as they pass over their territories. Microsoft recently sold its Bing division’s mapmaking unit to the Uber rideshare service. Tarr declined to say whether Uber would be using DigitalGlobe’s imagery in the same volume as Microsoft. Tarr said DigitalGlobe’s competitiveness, for 30-centimeter and other imagery, is demonstrated by the fact that the company won more than 75 percent of the competitions it entered during the three months ending June 30.